There's already a question for this, I tried to "bump" it with a comment, but it didn't show up on the Active Page. Can we setup a different style for links on the Server Fault page to make the link stand out from the rest of the text, like meta.serverfault.com has? Having them at least dot-underlined like here on Meta would be a great improvement already. Keep an eye out for rev 2014.6.12.1659. 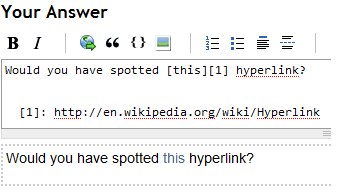 Since the beginning of SF I've thought that our link-style is somewhat unreadable. I find links, especially followed links, are not distinctive enough from the normal text style to be uniformly distinguished when reading. I miss them frequently. Less so now that I've been here a while, but more often when I was new. The dotted-underline of Meta is very nice, and I appreciate it. The link-styles on every one of the SE sites I've been to have been noticeably more distinctive than SF's. The blue stands out very well to me. From that viewpoint I don't think it really needs to be changed. However, quite a few people have now complained about this, so I'm starting to think that there's a wider variance in color perception than I had previously considered. Perhaps the site should have an accessibility mode available for those with diminished eye sight; which would make links underlined and possibly bold or some other strong visual indication. Also possibly related, have you ever taken a color blindness test? Not the answer you're looking for? Browse other questions tagged discussion feature-request status-completed design .